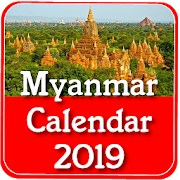 This Myanmar Calendar 2019 brings you daily calendar in Burmese language, English horoscope forecast, Myanmar Govt and Bank holidays list, Myanmar festivals, puja, cultural celebrations, etc. at your finger tip. This app is useful for Myanmar people and Burmese speaking people across the world. This application is a great tool and must to use app for productivity of your day with different types of information and tools.